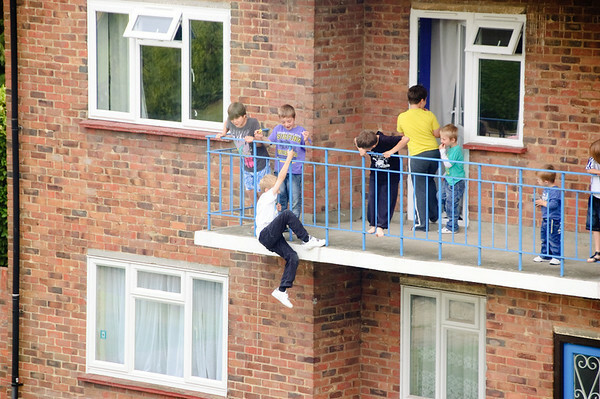 Yes, that is a child on the wrong side of the balcony rails. This photo was taken as the boy was climbing back over the balcony rails after he thought it would be a good idea to dangle by ONE hand from the first floor balcony rail. I have no idea where the responsible parents were. They were definitely in, but certainly not keeping an eye on their kids. Unfortunately, this isn't the first time he and the girl pictured (far left), who also climbed over the rails on this occasion, have done something stupid like this. A couple of months ago, Claire and I were sitting on our balcony enjoying the sunshine when these two thought it would be a good idea to climb out of the window you see on the top-left onto the window sill. That time, Claire marched over to inform the parent (of the girl) who was meant to be keeping an eye on all of the kids (4 of the 5 in the flat in the picture plus two and a baby of her own as the parent of the 5 kids was taking one of his to A&E after she came off her bicycle) of this and her attitude left a lot to be desired. She reprimanded the kids at the time but we couldn't help but feel this was only for our benefit. Her attitude seemed to indicate she had better things to do (watch TV) than look after her and someone else's kids. I didn't dare say anything whilst the kids were dangling or in a precarious position as my booming voice is likely to have given them a fright most likely resulting in a fall and then I would be the one in trouble for shouting at someone's precious darling whilst they were dicing with death or at least injury. Yesterday I just took a photo and included it in a lengthy complaint email to the management company - the kids' screaming, shouting, ball games, litter and general behaviour has been going on long enough with little action from the parents involved. I'm not holding my breath that anything is going to be done right now as I think the families involved are council placements and most of these issues fall into the realms of parenting, but I'm hoping that if there are enough complaints (all this behaviour goes against the leasehold agreement on the flats), the council will be told to move one or both of these families. Of the two families, I think the two children from the ground floor flat (which includes the girl mentioned above) are the bad influence on the others. The others seem to be decidedly better behaved and quieter when they're not around. I'm hoping it doesn't take a serious accident, like a broken neck, for the parents involved to actually start keeping an eye on their kids. Oh yes, and what annoys me the most: there's a huge park less than 400m up the road.